The rhythm did not get me… Or shall we say I did not get the rhythm. Having been a late 80s baby, I grew up ‘Oyendo El Canto’ to ‘turn the beat around’! I even used to perform makeshift concerts as a child, imitating Gloria Estefan and one year I asked Santa if we could go for a BBQ at the Estefan’s Home! 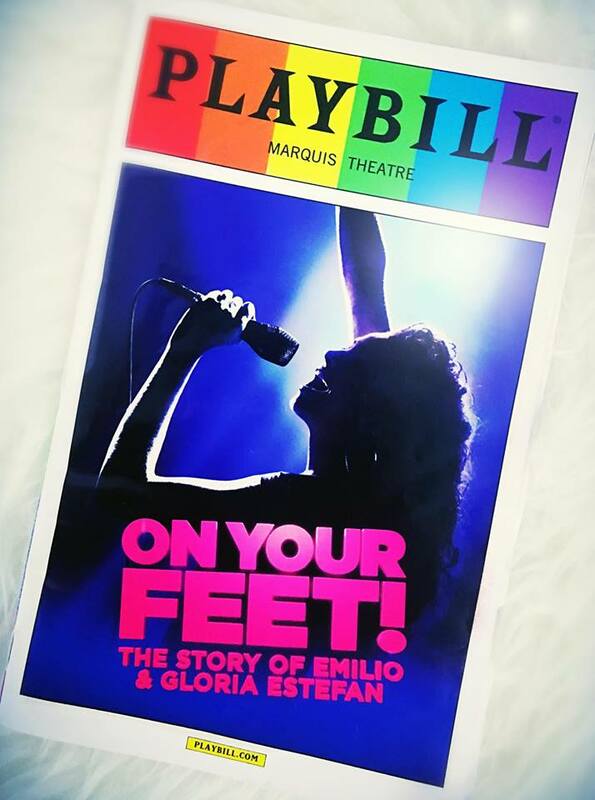 I was all but stoic, when I purchased my tickets to the Estefan’s Broadway show, ‘ON YOUR FEET’, about 4 months ago. Over 100 million records sold, stadiums sold out around the globe, and 26 GRAMMY Awards to boot… The story of Emilio and Gloria Estefan, exiled children of the same Cuban political oppression felt by my parents, who overcame all of the obstacles to succeed, is the hypothesis that was engrained into my childhood, it was that record, to which I set the tune of my dreams to. Needless to say the Estefans’ paved the way for artists from all corners of the Hispanic market, to retain the ability to crossover into the American market— it’s just one of the billion reasons Y going to New York City to catch a glimpse of the Broadway musical ‘ON YOUR FEET!’ was a no brainer! Then the ‘smash hit’ smashed my expectations. Listen, I too love the essence of the script, penning a rags to riches story, about making dreams come true after coming to this country with just nothing but ‘the dream’. I know the story, I too am part of that same story… BUT, it didn’t make me want to ‘get off my thing’ and on my feet. My expectations fell short on the notes of grandeur and excitement, which makes me want to move my body (Yeah, Yeah, Yeah)… Okay, Okay I know one too many of those lyrical associations and you are ready to throw a record at my head, but prepare yourself no apologies here, I am keeping them coming! After watching remarkably electric performances from the cast of ‘ON YOUR FEET’ during The Tony’s, The Macy’s Thanksgiving Day Parade and EVEN the trailer for the show… I sat in a perfectly situated Row J at the Marquis Theatre, hopeful with the glimmer of my childhood idol seeping through my toes. I was so eager to be inspired to fall in love, with the love story of two souls that connected through their incurable rhythmic je ne sais quoi. Which, just FYI… I attribute to a mutual love and respect of music, but then throughout the play I come to find out his lyrically persistent sense of self was one of the most attracting qualities for her. Yet, that was precisely what was missing, the ‘Fire of Desire’ that is so evident between Emilio Estefan’s character played by Josh Segarra and Gloria Estefan’s character which was supposed to be portrayed by Ana Villafañe… all of the hype I had heard about the play went flat starting with the first notes when Villafañe wasn’t Gloria. Villafañe a Miami born and bred girl, who attended the same high school as Gloria Estefan, learned of the Miami open casting call and, sent the casting office a video audition. We’re talking a girl who grew up portraying Gloria Estefan songs during talent shows, this is THE Gloria, but she wasn’t MY Gloria on Wednesday night’s performance, ensemble cast performer Linedy Genao was. My biggest disappointment… Where was that in inalienable chemistry exuding from the actors that would make me want to believe in LOVE again? It’s that infectious concoction of isms that you find when you watch two actors who have been living, breathing and being roles for over a year. That is precisely what I saw between Josh and Ana portraying the roles in previews, but my buyer’s remorse slowly set in as I crept into my burgundy theatre seat, moments after the grand reveal, did NOT reveal Villafañe. The highlight of the show was being able to watch rising star Josh Segarra on stage. He carried the show and overcompensated as any true professional would for having an actress a bit green on the chart fill-in for Villafañe. This Hollywood actor who graduated form NYU’s Tisch has had countless on screen credits to his name from “Chicago PD” and “Homeland” to ‘Trainwreck’ and it shows, proving Y he got top billing. Segarra embodies the essence of Emilio Estefan, I was raving of his performance from his first 3-point step, when I could feel his connection to the character, it was flawless because he was having fun with it and living in the role. JS blew me out of the water, representing the essence of Emilio Estefan without trying to impersonate him and giving me the space as an audience member to feel that same infectious feeling that translates into anyone when they are listening to Spanish music. Notes are supposed to float through your blood and make you want to get up and dance, as you feel the waves of the ocean from the ’Tierra’ now known to many as a ‘not so forbidden fruit’— the beats are seamlessly orchestrated in Estefan’s music to help the music roll through your bones even if you are not Latin and this Actor of Puerto Rican decent accomplished just that! He made my bones roll and I bet he will make yours roll too, but don’t get too excited ladies- he’s married! 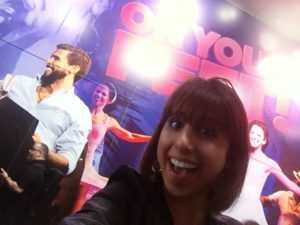 If you are headed to NYC to catch ‘ON YOUR FEET’ make sure to call before and ask if Villafañe and Segarra are BOTH on stage! Watch out for rising ‘Estrellita Del Oriente‘ Alexandria Suarez, who plays Gloria in her childhood! Suarez reverberated character soul way beyond her years, I could see her soaking in every second of her time on stage and as she digested it, she would share her glory back onto the audience. Her energy and smile were infectious, well done Alexandria!